Restaurant Spirit Events in May! Please support our coming restaurant spirit events! 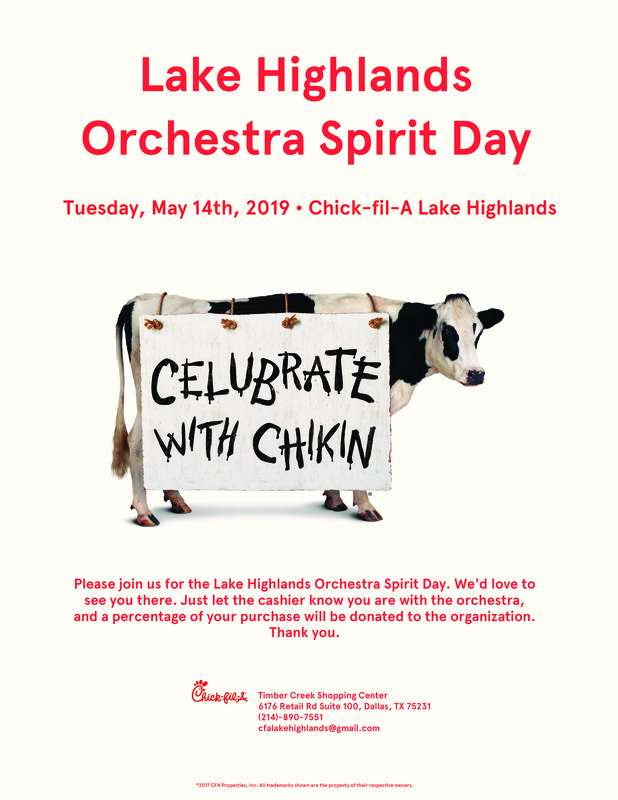 Please tell your cashier you are supporting LH Orchestra! 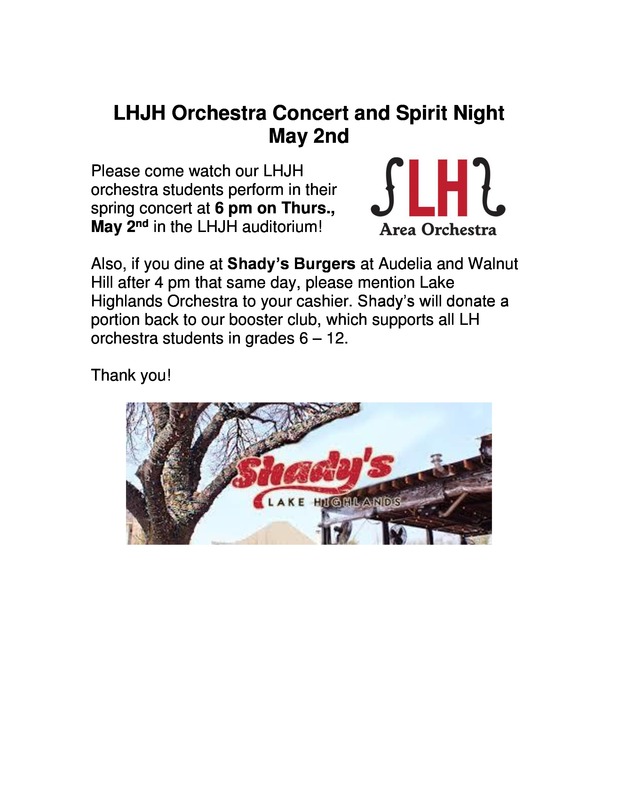 LHJH Spring Concert (6 pm) and Spirit Night at Shady's (Walnut Hill/Audelia) 5 - 10 pm FLYER HERE. May 2nd (Thurs.). Please tell your cashier you are with Orchestra! 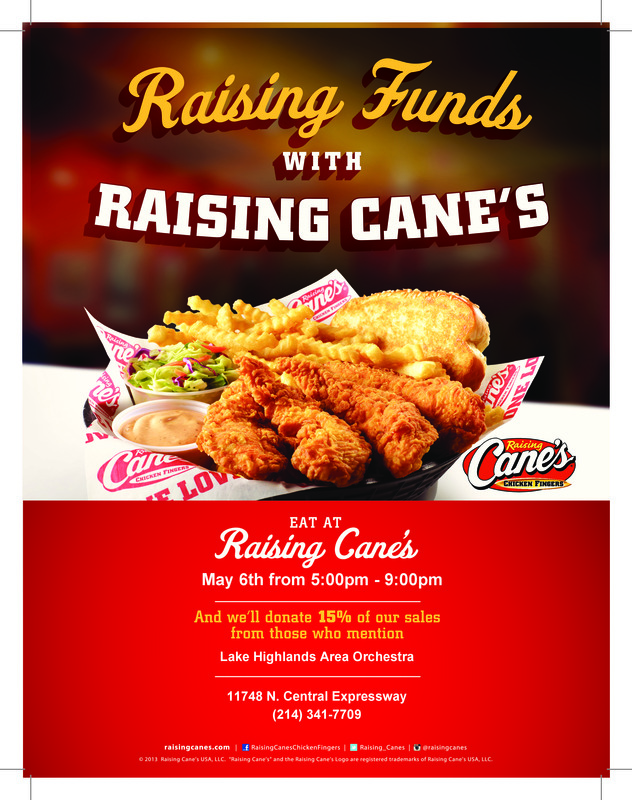 FMJH Spring Concert (5:30 pm) and Spirit Night at Raising Cane's (Forest/75) 5 - 10 pm FLYER HERE. May 6th (Mon.). Please tell your cashier you are with Orchestra! May 14th (Tues.). Please tell your cashier to put your receipt in the Orchestra fundraising box! Congratulations to our Orchestras: Awesome UIL Performances! Congratulations to the LHHS Philharmonic & Symphonic Orchestras!!! Both orchestras earned a Sweepstakes Award at the UIL Concert and Sight Reading Contest on February 28th!!! ​Each group prepared 3 pieces to perform for 3 judges on stage along with performing a piece they have never seen before (called sight reading) for 3 different judges. All 6 judges give the orchestra a score from 1 – 4, 1 being the highest, based on their performance. A sweepstakes award is given when the judges give the orchestra an overall 1 on stage AND sight reading. ​This amazing feat has not been accomplished for about 20 years! Also, the Forest Meadow Junior High Symphonic Orchestra rocked the UIL by earning a Sweepstakes Award for the first time since 1996! Lake Highlands Junior High Orchestra received 1s on their rehearsed pieces and 2s on sight reading! Way to go, everyone!!! Please Make a Tax-Deductible Donation! NEW! Now you can donate on-line to our club by using this link, by clicking on the Donate button below, or by scanning the QR code to the right! Please Support Orchestra When You Shop! ​Amazon Smile: AmazonSmile is a website operated by Amazon with the same products, prices, and shopping features as Amazon.com. You only have to sign up once, then go to smile.amazon.com each time to do your Amazon shopping. Kroger: If you haven't already, please register online here, starting with signing in or creating an account. Look up Lake Highlands Area Orchestra Club or enter our NPO number (ii646) to link your card to Orchestra. It's quick and easy! Need help? Here's an instruction page. Tom Thumb: Print this and enter your information. We are charity #2452. Drop off at the customer service desk of your local Tom Thumb. ​NOTE: For both Kroger and Tom Thumb, you only have to register your rewards card once, then present your card to the cashier as usual (or enter your rewards number) whenever you shop. Please take a few quick minutes to register; they pay us well! Please support Orchestra when you eat at Shady's on Walnut Hill at Audelia by playing our video game and donating to our club!